John Woods Nurseries is today celebrating yet another major honour after capturing a top award at the prestigious HTA National Plant Show. 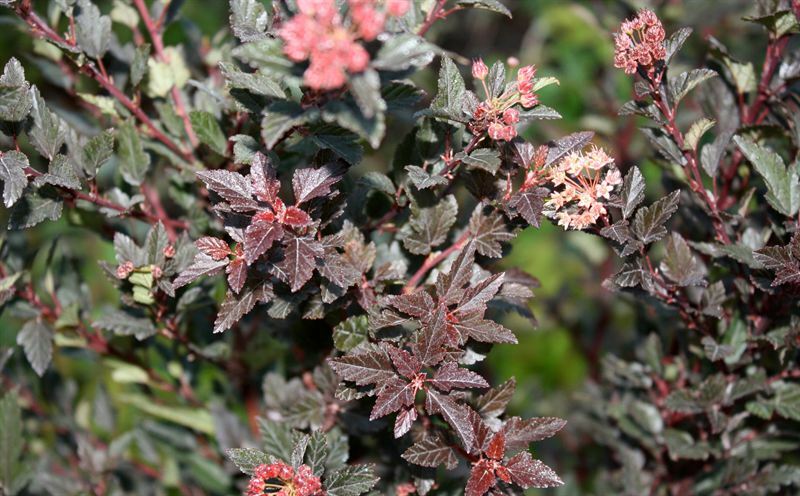 Physocarpus Little Devil picked up the title of ‘New Plant Award, Best in Category, Hardy Nursery Stock’ at the annual horticultural showcase, which opened today at Stoneleigh Park in Coventry. It is the latest accolade for the Suffolk-based supplier of plants who are previewing nine new products at the HTA event, which will be launched next year. The Physocarpus Little Devil, which was bred in the USA by David Zlesak, is perfect for smaller gardens or where space is limited, reaching a height of just 90cm. The rich plum-purple foliage acts as a great foil to shrubs and perennials, while the white-pink, button-like blooms in June to add another season of interest for this easy to care for shrub. Victory at the HTA National Plant Show continues an amazing year for the national supplier of plants to garden centres and retail nurseries across the UK. The company, which produces hardy nursery stock on a 95 acre site north of Woodbridge, won silver-gilt flora honours at both the RHS Chelsea Flower Show and the BBC Gardeners’ World Live Show, coming just 12 months after clinching gold at the RHS Chelsea and Hampton Court flower shows. John Woods Nurseries is an historic brand stretching 174 years. The company’s product range extends to 1,500 lines in a range of sizes across shrubs, perennials, roses, ericaceous plants, climbers, trees and fruit. More than 1.3 million units are produced annually. John Woods Nurseries is showcasing its new products from stand 73/74 for the two-day show which finishes tomorrow (Wednesday, June 29). More information is available from: www.nationalplantshow.co.uk.